As a representative of a local history society we thought you may be interested in the work of the Secrets of the Sands Landscape Partnership. Bedfordshire Rural Community Charity and the Greensand Trust are leading the Secrets of the Sands Heritage Lottery Funded Landscape Partnership Programme for the Greensand Ridge. The vision is that by 2020 the Greensand Ridge will become a living and working landscape that is cherished by present and future generations and we will have reversed the gradual decline in the area’s landscape character. We would like to make you aware of the following? We will run a series of workshops to enable delegates to engage in identifying projects and priorities for action on the Greensand Ridge. We are doing a Landscape Character Assessment for the Greensand Ridge. This process involves us identifying areas of distinctive character, mapping them and describing them. This will help us to understand how to protect, manage and plan the landscape for the long term. As part of this process we are asking members of the local community to describe what matters to them and why and this will help us understand which places and views people value most. I am enclosing a questionnaire. I was wondering if you could fill this in and return it to us by the end of September. We would be very grateful; also do you know anybody else that lives in this area that maybe interested in filling this in too? If you could pass this e mail on to them, we would appreciate it. Due to the geology of the ridge many structures are built from locally quarried stone. These built structures add to the distinctive character of the area. We are doing a Sandstone Structure Audit with a view to restoring historic features made from local materials. Do you have any walls, bridges, milestones, really any structure that is made from locally quarried stone (not including houses or churches) in your area that would benefit from a restoration programme using appropriate heritage skills? The built structures can be in private or public ownership. We are running a workshop to hear from the community about opportunities they would like to pursue to create interpretation along footpaths, cycle ways or bridleways to engage people with the natural and cultural heritage of the Greensand Ridge. It would be great if you came along and joined us or if you knew of anybody that may be interested. This maybe the opportunity to engage people with the history of your area. 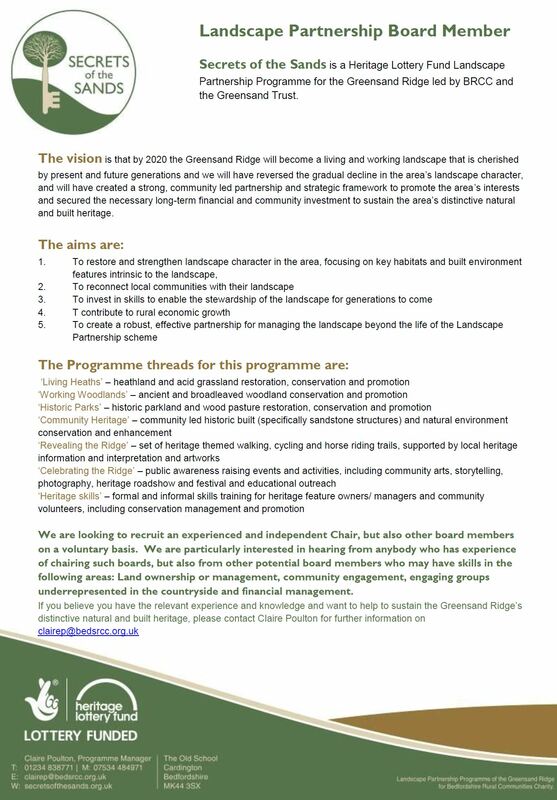 We are looking for a Chair and members to join the Secrets of the Sands Landscape Partnership Programme board. The board will have a strategic overview of the work on the Greensand Ridge and will balance between environmental, social and economic interests. It will be responsible for all key decisions. We would be interested to hear from you if you feel you have the right interests and skills and would like to join. We are looking for volunteers to help us develop the Secrets of the Sands project. Over the life time of the project we will have lots of volunteering opportunities, but at the moment we are looking for people who would be able to help us with specific roles. I am attaching a role profile showing the skills we are looking for. We would be interested to hear from you if you feel you would be interested in volunteering opportunities. The Secrets of the Sands Landscape Partnership Programme and what it is trying to achieve. The process for applying to be a member of the Landscape Partnership Programme board. If you would like any more information, please feel free to contact me at any time. Claire Poulton, Programme Manager for the Secrets of the Sands Landscape Partnership. My contact details are: clairep@bedsrcc.org.uk My mobile number is 07534484971. Claire Poulton, Programme Manager, ‘Secrets of the Sands’. ← Historic picture postcards – can you help?